There are a lot of sources of our motivation, but often these are derived from outside sources – your parents’ expectations, your friends’ suggestions, even your family’s needs. Although many of these are great reasons to be motivated, none of them are generated solely by your own ideas, your own aspirations, your Dreams. A complex product of our deepest desires, best intentions, far-off wishes and closely-held beliefs, our Dreams are the ideal incarnations of our lives that we hope to one day attain. Dreams are the ultimate life milestones that we set out for ourselves. They are idealistic depictions of “success” as seen through our own unique lens. Dreams, however, cannot become a reality until you see and believe that they are in fact a possible reality. Not just a picture of your life that you know in your heart of hearts is just a far-fetched, alternate reality that you cannot or would not ever reach. No, you have to be a believer. A believer in your own dreams. You have to believe that these dreams are an actual attainable future state. That, regardless of the probability, you have a greater than zero chance at reaching this milestone vision. It may seem quite ridiculous that you need to convince yourself to be a believer in your own dreams, but it is the only way that you can transform those dreams into a tangible target to shoot for with smaller goals to mark progress along the way. How do you make yourself a believer? Well, when you concoct your dream, you’ve got to immerse yourself in that vision so that you feel and experience all aspects of it. You need to feel the emotions, both yours and those around you. Maybe its elation, maybe its love or maybe it’s just relief. Regardless, you’ve got to let those emotions fill your being. You’ve got feel the magnitude of the accomplishment, feel the blood, sweat and tears that you shed to get to that moment. Let the atmosphere in your dream permeate your senses – the roar of the crowd, the smell of the parquet floor, the look on your dad’s face. But only for an instant. Only for few seconds, minutes. Let the dream feel like a reality for a brief moment and you’ll not only believe that it could become a reality, but you’ll be yearning to get there. To get those feelings back for real. To really cut down those nets in front of thousands of fans on the greatest stage in college basketball. This is what Jim Valvano knew. He knew he had a dream of a National Championship that he truly believed could be attainable because he felt it. But he also knew that he couldn’t make his NC State into believers just by preaching to them about his dream. He had to make them feel it too. They had to feel the cool metal scissors in their hands as they grabbed a piece of nylon and snipped it from the rim. They had to see their teammates looking up at them on the ladder. They had to get a taste of the celebration. They even had to record it all and see themselves on TV. Then they believed it. Now it wasn’t just a far-off idea, Coach V’s vision or wishful thinking. It was a dream that they could bring to life. It was their dream. And with that, Jimmy V showed us his genius of motivation. He dared these kids to not only dream, but to believe in those dreams, big and small. 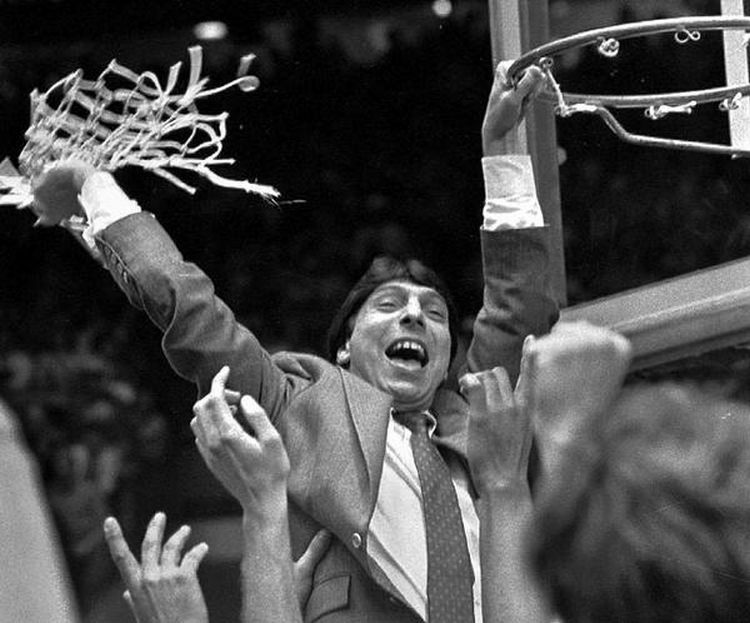 Check out this clip from one of Jimmy V’s famous speeches! Thanks for checking out the “The Drive.” Come back every week for quotes, pictures, people or moments that we hope can provide inspiration or motivation in your life. Or follow us on Twitter @TheDriveSports and look for #DailyDriver to get your daily dose of inner fire!